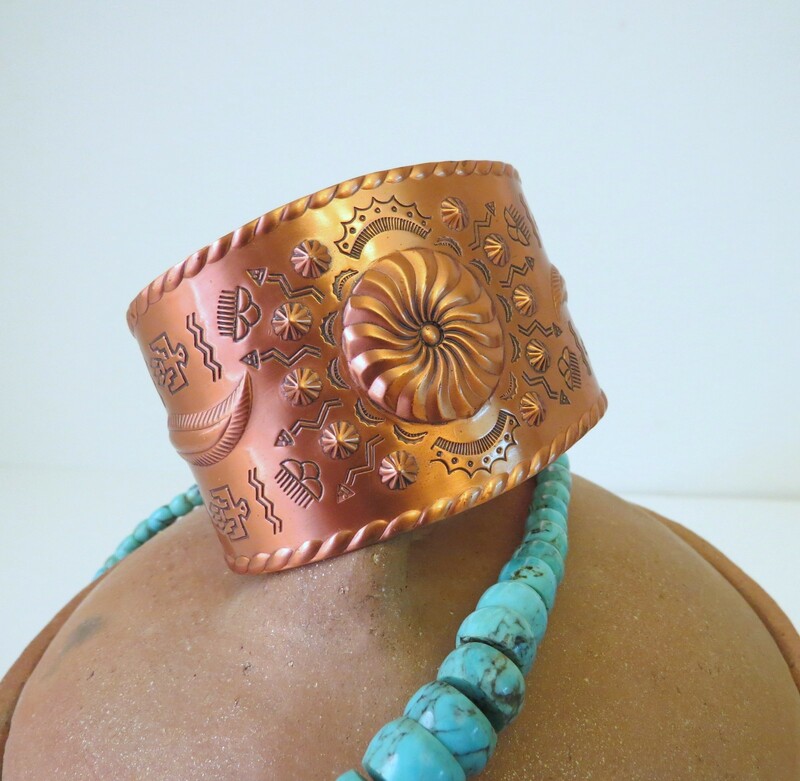 This is a new old stock vintage copper bracelet probably from the 1950’s or 1960’s made by Bell Trading Post. The inside of the bracelet is hallmarked with a Bell and Solid Copper. The copper is pliable so it will adjust a little in either direction. The Bell Trading Post was located in Albuquerque, NM and was founded by Jack Michelson in 1935. They sold "Indian Jewelry" to tourist locations throughout the western U.S. In 1972 their name was changed to Sunbell Corp. The items manufactured by Bell Trading Post can be categorized as Indian souvenir jewelry. Unlike items entirely produced and designed by Native Americans, souvenir jewelry has a machine-made uniformity and relatively delicate proportions. The pieces were smaller and lighter. Genuine turquoise was used but also imitated. Some pieces were made of sterling and others base metal. Finally, the designs usually had motifs easily recognized by the tourist: thunder birds, rain clouds, and bows and arrows. Bell Indian souvenir jewelry has recently become collectible. This type of jewelry brings back fond memories of summer vacations and the flashy items we always tried to get our parents to buy. Shipping: The price includes USPS priority shipping with tracking anywhere in the upper 48 United States. Please contact us for the international shipping rate for your country. Payments received before 1PM Central time Monday through Friday ship the same day excluding postal holidays. Payments received after 1PM ship the next business day. We provide you with the tracking number so you can track your shipment.